Everybody knew the music of Phil Woods, whether they knew it or not. It was Phil who played the alto saxophone solo on Billy Joels’s huge hit song, “Just the Way You Are.” His playing was heard on recordings by Paul Simon and on countless radio and television commercials. Woods, who died on September 29, was a remarkable technician, an inventive player, and so versatile that he was always in demand in all kinds of musical contexts. In his heart of hearts, though, Phil Wood was a be-bopper. Growing up in Springfield, Massachusetts, Woods acquired his first saxophone when he was 12 years old. A quick learner and a natural musician, he gravitated early on to jazz, listening to and absorbing the music and influence first of Benny Carter, then of Johnny Hodges. But it was when he heard the exciting new music of Charlie Parker that his life took its most decisive turn. Soon the young Phil Woods was traveling regularly by bus into New York City to study with the bebop priest himself, Lenny Tristano, and to hang out in the era’s jazz clubs, even sitting at the feet of Bird himself. Upon graduation from high school, he made the move to New York, where he studied classical music at Julliard for four years, at the same time experiencing the city’s jazz scene. Given Phil’s devotion to Charlie Parker’s music, it was inevitable that he would be influenced by the master and compared with him, just as were fellow alto saxophonists and be-boppers Sonny Stitt and Julian “Cannonball” Adderley. But Woods was no clone, establishing his own style, his singular brand of bebop—one that was energetic, virtuosic, humorous, and always, always musical. As a young graduate of Julliard in the mid ’fifites, Phil launched his career as a workaday musician, gigging around New York and wherever else he found gigs, also beginning to front his own bands. It was about that time that Quincy Jones discovered Woods and brought him on a 1956 State Department-sponsored world tour with a big band directed by Dizzy Gillespie. In 1962, he went to Russia with the Benny Goodman band, a very famous tour at the time. Woods lived in France from 1968 to 1972, leading an avant-garde-leaning group he called the European Rhythm Machine. After returning to the U.S., he formed a quintet which, with some personnel changes over the years, was still performing in 2004. 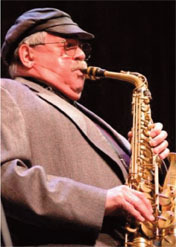 Throughout his long and illustrious career, Phil Woods recorded prodigiously. He was the subject of a 2005 documentary film called Phil Woods—A Life in E Flat: Portrait of a Jazz Legend. He was married to Chan Parker, the widow of Charlie Parker, for 17 years and step-father to her daughter Kim. He has been married to Jill Goodwin, sister of longtime Woods drummer Bill Goodwin, since the ‘70s, sharing a home with her in Pennsylvania’s Pocono Mountains. He was 83 when he died in East Stroudsberg, Pennsylvania.